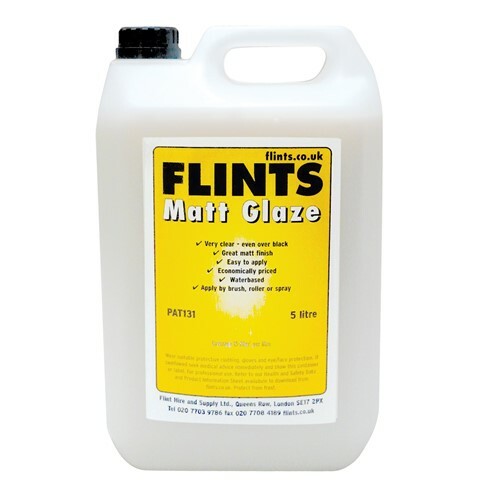 Flints Glaze is different to most PVA emulsion glazes. You will find it has greater strength and durability and more water resistance. Good gloss level from Gloss Glaze. Low reflectance from Matt Glaze. Apply over artwork to protect from marking. Can be wiped down with a damp cloth. Amazingly tough scratch resistant finish. Mix with scenic paints for extra strength or eggshell effects. Good flowing characteristics make these glazes easy to brush. Coverage is 15-20 square metres per litre. As with all makes of glaze the most prevalent problem is ‘blooming’. This is nearly always caused by poor drying conditions especially when the glaze is applied late in the day and left to dry in a cold workshop overnight. The situation is worsened if the base paint has not thoroughly dried and moisture is trying to migrate out through the glaze. In many cases the bloom will gradually disappear. A gentle heat from a hair drier will normally indicate whether the glaze will recover or if the area needs re-painting. © 2015 ProspectSoft Ltd. All Rights Reserved. Not to be reproduced without written consent.